Or at least, hasn’t been there yet. Recently I had to do one too many cart tests, and one of most annoying things was when I had to empty it, As anyone – I had to click it one by one. Today I’m going to explain how can you avoid this by simply creating one simple extension, and enabling “Empty cart” link functionality. It really isn’t that hard. All you have to do is create yourselves a small extension that consists of Block, Controller, XML, Model and Template with very little logic inside. Besides there’s a hoot to event here (for link injection into cart), it’s pretty much basic stuff. And for those of you who are too lazy to create extension :D, you can download it here. But note that you’re using it without any warranties and please create a backup before you install it. I hope this helped someone with same frustration I had! Hi, i was thinking about put a similar button on the customer edit page, on magento admin, did you found a similar solution? I was looking for these functions in this file: /app/design/adminhtml/default/default/template/customer/tab/cart.phtml, but those functions can empty only item by item by default. If you have any suggestions, please send me. Hello how can I make a redirect to the same page? User can press a EmptyCart button from any page through the right column. Really need that would redirect occurred on the page where the user was in the moment the button is pressed. You can delete my first comment. I success. Think it’s due to Apc cache was not deleted correctly. Thank you for your extension. I put it in on my website, but i have a problem of route. When i click on the link, i redirectly in my 404 page. I don’t undestand but my plugin is enabled. Have you an idea ? Make sure your config file is setup correctly, and your Observer file is named correctly. You should be sure to use the proper naming scheme in all files in this and other custom modules. It looks like yours may not be named quite correctly. I am running 1.6.1 and am getting this error also. Sorry for the Noob question here, but can someone point me in the right direction and give me the actual path to the cart.phtml? Am I right in thinking is is this? Also, whereabouts do I insert this code (see below) as a link within this file? This module looks great, but I think you could get a little more efficiency out of it by not calling save() until after the loop. That way you only have to make one DB call instead of one for each item you’re removing. Thanks a lot. It helps. I have found this bug in exception log after copying the EmptyCart Module inside my Inchoo folder and my whole website went down…. Is there a easy way to remove a product from cart as soon as its disabled? You can use the iMacros extension for FireFox to do the clicks. 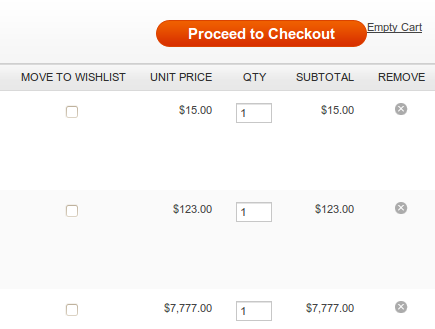 This sets all of the Quantities to 0 and I update the cart and voila! everything is gone. I could add some code to submit the form but I usually want to keep 1 product around so I set all to 0, set one to 1, and then submit. i use this , and solve my problem. i hope someone can get helping form this. i installed it,but it still doesn’t work.i think i’ll try matt’s idea later. my vesion is ver 1.5.1.0. Sorry Billy, you may just be better off to upgrade your install… 1.4 performs considerably better anyway. Thanks for reply Matt… I’m afraid I don’t have the slightest idea what to look for. I found a mod that worked on my 1.3 site in the past but I can’t find it now.. They made a bunch of changes with how things are set up and how they run going from 1.3 to 1.4…you may want to check out some of the differences between the different versions of Magento to see what all changed and then update accordingly. I just used Matt W’s code above to add the button to my checkout and it works like a charm. You guys are awesome. Does anyone else think it’s weird there isn’t an empty cart in there by default? Sometimes you just have a ton of stuff that you wanted to calculate shipping on and then start over. Having some trouble getting the link to actually show up on the cart page. Running Magento 1.5.1.0. Has it been tested on there and I am just messing something up, or does it only work on older versions? Thanks for the help, and for all of the great posts here. Keep up the good (and extremely helpful) work. Nice bit of code. I also find it a nusance when testing and you find you’ve got 500 items in your cart. My solution until now is usually to clear the server cache lol. Ah, nice one. I always made a small JS function that just fills zero’s for the all the product qty’s and than submits the update cart link. Your extension is way more easy, thx! Would be cool to create an extension dedicated to help make acceptance testing. For example helping making some test with Selenium. @Bruno – At first, I wrote “Recently I had to do one too many cart tests”… That’s why I wrote this extension, it might help someone. Bruno, they can empty the cart anyway. It’s just more painful user experience to empty every single item one by one.